Case studies have now been launched on Goodfellow.com showcasing real world examples of applications where Goodfellow have provided an array of materials either from their catalogue or as a bespoke item to aid R&D projects and prototypes. Within the Automotive sector, Goodfellow worked with Formula Student team, Instituto Tecnico at the University of Lisbon for the development of an innovative electric race car. Comprising hundreds of teams across the world, the international engineering design competition sees vehicles compete at a series of international events. Goodfellow supported the two latest prototypes, the FST 07e and FST 08e and supplied copper mesh and titanium bar. Goodfellow has also provided bespoke alloys for use by a world-leading aerospace manufacturer focused on satellites and engines. Behind some of the world’s most innovative technological developments, research and development is a key part of the company’s goal of achieving ambitious environment protection objectives. Over several years Goodfellow supplied low to medium quantities (in varying amounts of kilos) of specific types of alloys including Tungsten, Molybdenum TZM, Tantalum, Rhenium and Niobium. The materials provided have played a vital role in the development and production of the next generation of aircraft engines. In the Defence sector, wire has been provided by Goodfellow and has been applied in the development of technical devices. Around Europe components have been used for different tactical applications. The quantities of the materials used were a few kilometres of Niobium Titanium wire. The focus within the Defence sector is to use higher quality materials to ensure durability and long- term cost effectiveness. Goodfellow undertook an extensive array of tests on new products in order to guide the client towards material selection for specialised projects within the defence industry. Another key customer, operating within the Manufacturing sector, is a world-leading engineering and scientific company with expertise in precision measurement and healthcare. The materials required in this case were standard ceramic items which meant that it was vital to keep costs down to a manageable level that would support ongoing production. The long-lasting relationship helped to ensure that the project was handled efficiently and precisely. 3D printing appears today as an exciting shaping technique in different fields including the medical, electronic and automotive industries. Goodfellow has an in-depth knowledge of the latest additive manufacturing processes and provides the raw materials needed for 3D printing with a high attention to detail meaning services are expertly tailored to the design, function and product life of the application. 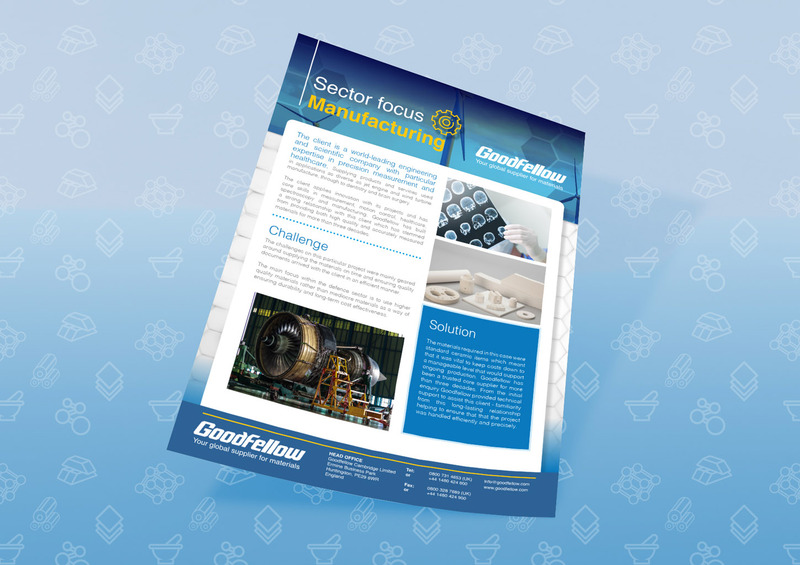 Over the coming months Goodfellow will continue to add to its portfolio of case studies to demonstrate how companies in a variety of different industry sectors can take advantage of its research materials’ expertise in order to facilitate their own industrial innovation.